I'm finally catching up on trying the various varietals from Layer Cake Wines. This is my first tasting of the Layer Cake Chardonnay, the 2011 vintage to be precise. Now if you've read through some of my wine reviews, it's likely you'll notice that ever since my first review of a Layer Cake wine with the 2010 Layer Cake Malbec back in 2011, more and more I've been talking about how consistent they are in putting out great wines that are under $20. And it's true. I have yet to taste a Layer Cake wine that has been a letdown. Far from it. They consistently produce bold, flavorful, quality wines. Anyway, so the 2011 Layer Cake Chardonnay is made from grapes grown at their Monterey and Santa Barbara vineyards, just like their Pinot Noir. The Chardonnay is fermented in stainless steel tanks then a portion is aged in 3 year-old air-dried French oak casks. The part I find interesting is that this is the only white wine Layer Cake puts out. I guess considering the cake theme that makes sense in a way, but it's also a bit interesting. At least to me. But then again, I have been known to over think things. 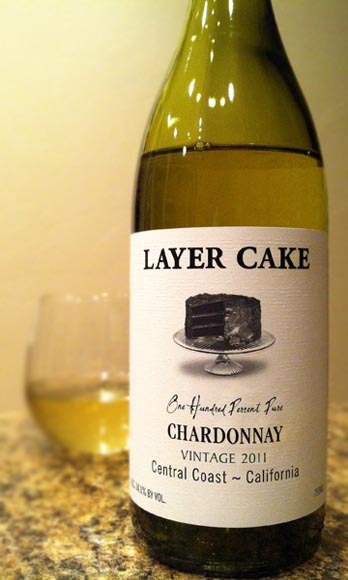 The 2011 Layer Cake Chardonnay pours a crystal clear, pale golden yellow-green color. Aromas are of lemon zest, lime, and green apple. Tasting brings a wonderfully crisp, bright, yet a bit creamy and light blend of lemon-lime, tropical fruits, pear, and lingering honeydew melon flavors in the finish. It tastes like a warm summer day laying on the grass, eating fruit, while staring up at the gorgeous blue sky with a big cheesy grin on my face was somehow metaphorically bottled up into a wine which I then drank into my belly. Drink This: if you want a nice, mellow white wine. Don't Drink This: if you're looking for a heavy, buttery, heavily oaked Chardonnay.